My 18-month Tsinghua-INSEAD Executive MBA (TIEMBA) journey is coming to an end in the coming month. I thought of writing an article to celebrate this experience and encourage others in the quest of finding a new direction. The EMBA will change your life and view if you allow yourself to be open and receptive. Here are my thoughts on the programme. Professor Neil Bearden, who taught a class called Management Decision Making, said that discipline gives one freedom. It sounds counter-intuitive but discipline in reading, learning and exercising prepares me to enjoy life and live up to my potential. The value of money extends beyond the monetary, to greater time, knowledge and health. #2: I don't know what I might be good at. I have been a marketing strategist but wasn’t trained in finance. Reading balance sheets and income statements used to scare me. However, I am pleasantly surprised by how much I like it now after acquiring a new level of proficiency. Gaining financial knowledge and language skills have equipped me with the acumen to run a business effectively. So be prepared to discover your new superpower and strength! #3: I am not perfect but a diverse team might be. A lot of teams fail because there is too much similarity. In a diverse team, the members challenge themselves to think in different ways and look beyond their blind spots. I remember the excitement during our first module on Macroeconomics, when we shared our thoughts and diverse experiences. We learnt that each one of us has a unique thought process and that we could build on each other’s ideas. 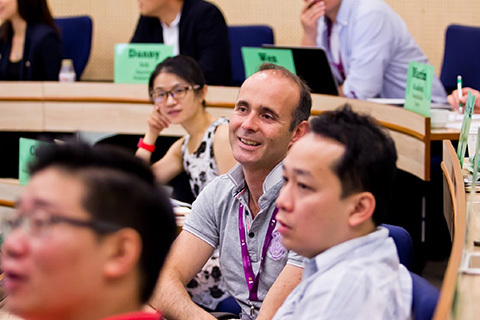 Furthermore, Tsinghua and INSEAD are two different institutions with their own unique culture and teaching philosophy, and we learnt to adapt and get the most out of both. #4: Communicate openly and give feedback respectfully. The classroom provides a safe ground for students to feedback on other participants’ behaviours, attitudes and biases without bearing grudges. It also reminds us that the same message might be perceived differently by different people. Communicating respectfully sets you up on a good start but don’t beat yourself up if others do not give you the appreciation you expected. #5: We only have finite time. I have always tried to do it all and my best. Spending time on work, learning and other things is important, but your own well-being is equally important. You cannot pour water out of an empty glass. I learnt to say “No” and spend time on things and people that truly matter to me. #6: We wear our own brands. Working in big corporations is not everything. Transitioning from one career to the next may be the true test of your character and who you are. When you are comfortable in your skin, others will automatically be drawn to you. Looking back on my time in the Singapore, Beijing, Abu Dhabi and Fontainebleau campuses, I have mixed feelings about wearing my graduation gown in less than a week. Education is a privilege as it opens doors. I don’t know where my door will lead me to but I am excited and certain it is a better place. Congratulations class of TIEMBA 2017 & GEMBA 2016 and thank you for being part of my journey. I am sure our bonds will remain strong.